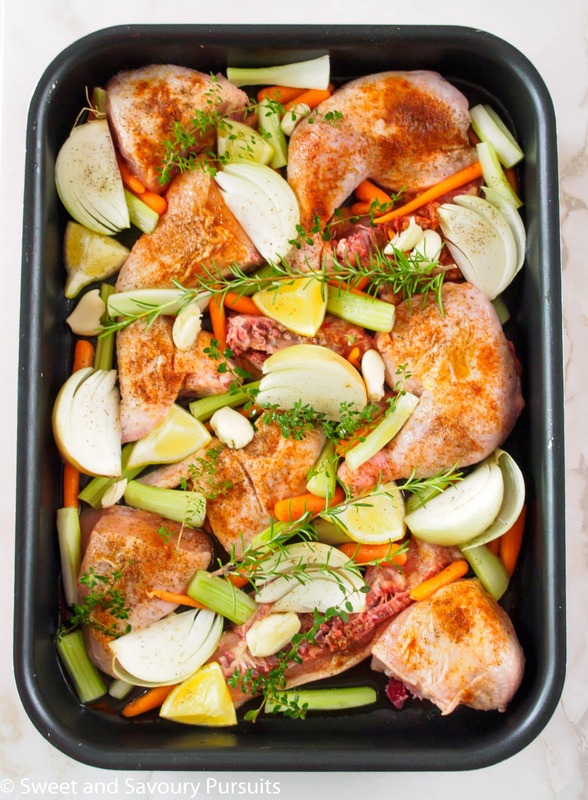 Turn simple ingredients into a healthy and delicious dinner with this easy recipe for a moist and flavourful One Pan Roast Chicken. The smell coming out of my kitchen while this chicken was in the oven was so good and so comforting. I’m not sure why, but there is something about the smell of roast chicken that makes me feel so content. Luckily there is nothing simpler than roasting chicken 😉 . First cut up the whole chicken in pieces so that it cooks quicker. To add flavour to the chicken, add some onion wedges, celery and carrot sticks and some smashed garlic cloves to the pan. Chop a lemon into four pieces and add it to the pan along with some fresh herbs (or dry, if fresh isn’t available). I used thyme and rosemary, but you can use what you prefer. Drizzle olive oil over the chicken and veggies and sprinkle everything with salt, pepper and some paprika. Finish by pouring some chicken broth in the bottom of the pan. That’s it, so quick and easy! 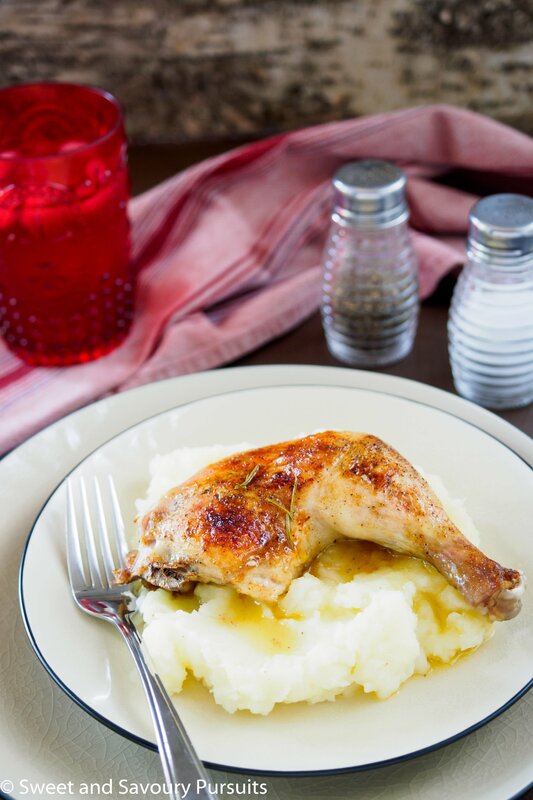 The chicken comes out moist, tender and flavourful, I like to serve it with mashed potatoes and use the pan sauce as a sort of gravy. 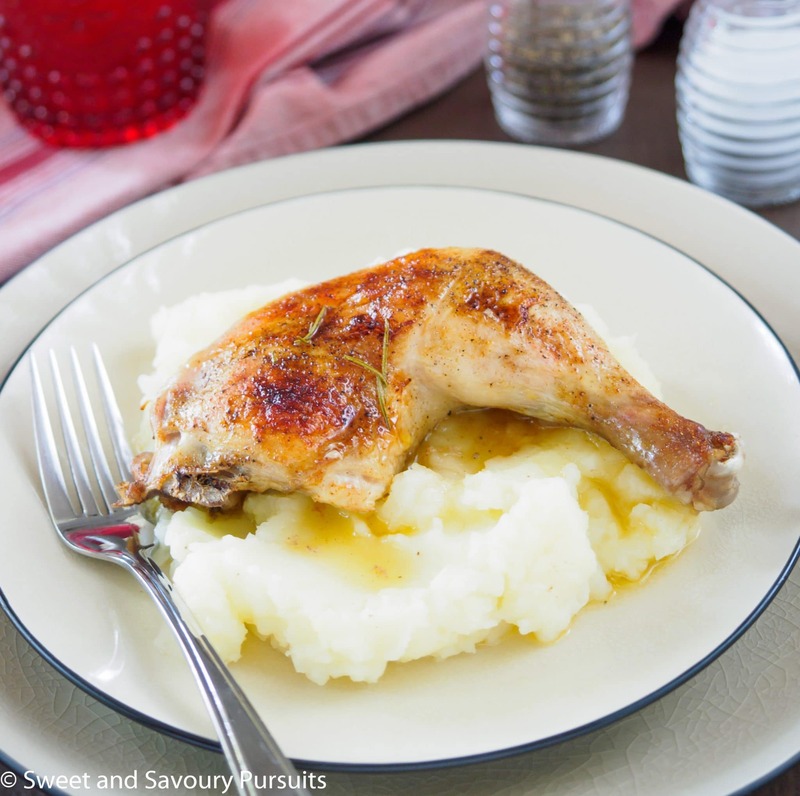 For a quick and easy low carb dinner, serve this chicken with mashed cauliflower and steamed veggies on the side. My favourite part of making roast chicken is that you can use leftovers to make so many other dishes. I used my leftovers to make chicken quesadillas. Enjoy! Rinse the chicken and pat it dry with paper towels. Remove excess fat and the giblets from the chicken cavity. Cut chicken into pieces and place into pan. Scatter the vegetables, lemon and herbs around the chicken pieces. Using the side of a chef's knife smash the garlic cloves and scatter in the pan. Pour chicken broth into pan. Roast chicken for 40 to 45 min. Pierce a chicken thigh with the tip of a knife to check for doneness. If juices run clear, chicken is cooked. If not, cook chicken longer. I made this tonight and it was WONDERFUL. Rave reviews all around. My new favorite way of making roast chicken! Thanks so much Anna, so happy you liked it, I really love the idea of brussels sprouts with this dish, sounds like you made the perfect dinner! The Hungry Dad wouldn’t believe his eyes if I made this dinner for him 😉 Amazing. I LOVE roast chicken! Yours look incredible, that golden colour – oh man, I want to grab my fork and dig right in! This roast chicken looks delicious and easy to make. Here’s to One Pot meals! This is perfect for a quick and easy weeknight meal and I love the color you got on the chicken! Thanks! Yes, I think I need more one pot meals in my life 🙂 The food is more flavourful and cleanup is much quicker! This looks wonderful! I love your choice of veggies and rosemary that you used in this, too! Thanks Nancy. Rosemary is great with chicken. i love this recipe looks so delicious! Yum, roast chicken is the best comfort food there is. This looks delicious!